Last year, 66 million U.S. residents shopped online on Black Friday, topped only by 81 million on Cyber Monday. As an onslaught of consumers gear up to use retail and deal finding mobile apps to take advantage of post-Thanksgiving sales, companies should realized that many of those apps have security flaws that could compromise customer data. A staggering 85% of the 45,000 mobile apps reviewed for this benchmark analysis violated at least 1 or more of the OWASP Mobile Top 10. This benchmark report identifies significant risks of data leakage in mobile apps with insecure data storage, insecure network communications and insecure coding practices that all organizations must address in their risk models and app security programs. 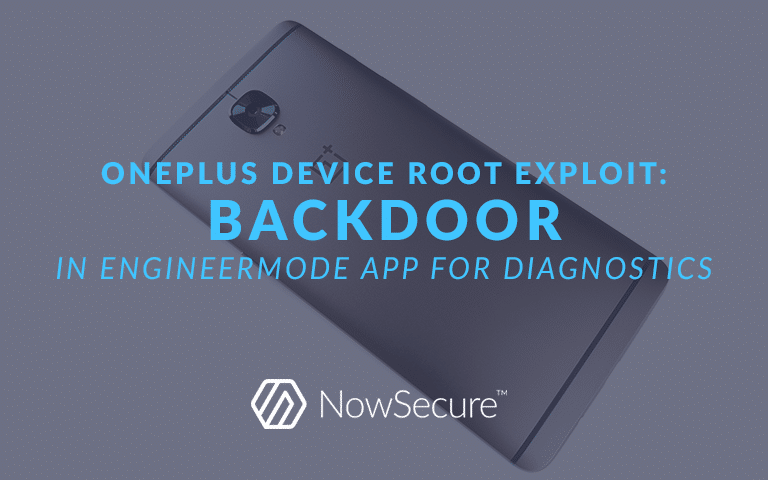 Learn more about the OnePlus device backdoor created by the EngineerMode App and how the NowSecure Threat Research Team helped verify this root exploit. A researcher published the decryption key for the iOS Secure Enclave Processor exposing a critical new risk within the iOS operating system. We’ve verified this information and explained its impact.